The Suorin Air Kit is another great All-In-One Pod/Cartridge System to be introduced to the vaping market. These pod systems give you the satisfaction of vaping while keeping your device small and discrete. 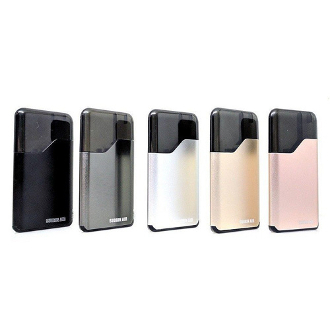 The Suorin Air has a classic automatic style. This means it has no button and you simply inhale to experience the vapor. It uses a 2ml magnetic refillable pod/cartridge system that makes them a breeze to fill and maintain. This pod system should be used with Nic Salts or high PG e-liquids. Using thicker, high VG e-liquids will gunk up the atomizer and cause it to have unsatisfactory vapor production. The built in battery has a 400mah capacity and an output wattage of 16W. The Suorin Air has a convenient battery life indicator LED light to let you know what the level of battery life is for your device. When this kit needs to be charged, simply use the designated included charging cable and micro USB port. Dimensions: 3-3/8" x 1-3/4" x 1/4"